Is it easy to create and maintain custom user interfaces in Scorpion? It has always been easy to create custom interface pages in Scorpion. They can be developed as web pages, activeX control, .Net objects or as Data Input pages. When we invented the The Data Input page concept we did not understand how important this was for Scorpion Vision. The basic idea was to replace the need for custom html or .Net pages that is easy to embed in the Scorpion Application. It is used in almost all Scorpion Vision Systems. 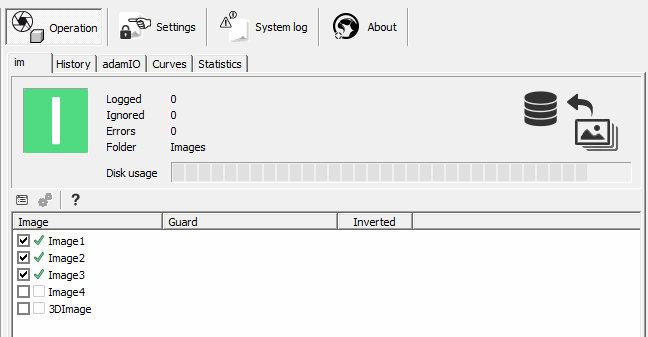 The main purpose is to let the profile builder to quickly expose selected parameters to be configured by the operator or the user of the Scorpion Vision profile – it is easy and extremely powerful feature. With data input concept the pages are built on site and often maintained by the operator. This means that they are up to date and defined by the people using it. An input page consists of named groups or sections. In each group a list of editable parameters is contained. A group or an item can be copied between pages and profiles. The Data Input concept is also added to the generic BaseTool for creation custom user tool and the ToolBox. This means that the user interface is moved out into the tool where it really belongs. In this way it is possible to copy the tool including the data input gui between profiles. Below an input page is added to the Settings tab – password protected with the operator password. Does Scorpion Vision have a device independant IO system? Yes – with Scorpion Vision Version X.I we have added a very nice device independent IO system that is easy to configure. The data panel provides built in statistics. The event of provides an easy to understand log of io-event – invaluable in io system verification. Is it easy to create an image log in Scorpion Vision? 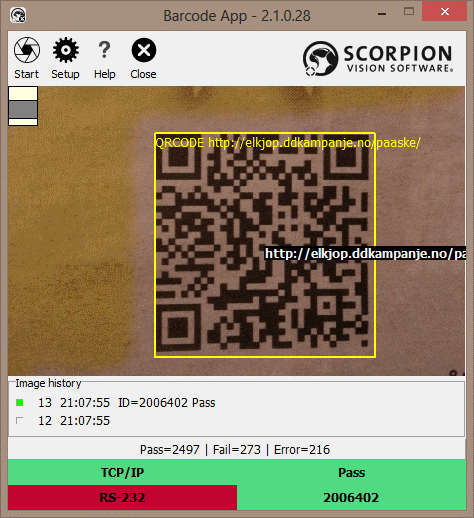 Yes – it is very easy to create an Image Logger with Scorpion Vision Software Version X. 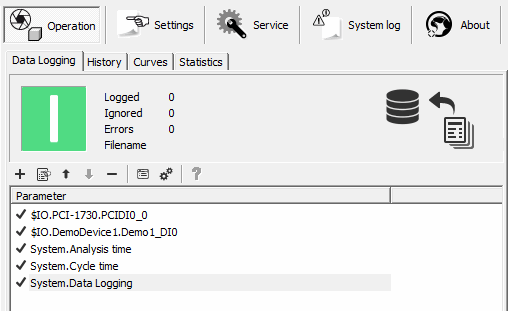 Turn on of the logging based on an external input defines by a master system – eg PLC or Robot. Stamp every image with serial #, batch # and inspection state for easy retrieval. All the functionally is available without any programming or scripting in an easy to use graphical user interface. 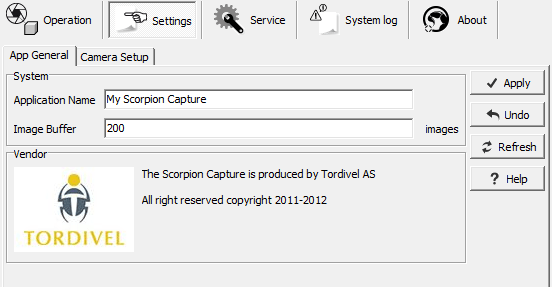 Can Scorpion log data to files? With the release of Scorpion Vision Version X we have added a very good and easy to use module to provide dynamic data logging of calculated values and values measured from other input devices. All functions are provided without any programming or scripting. 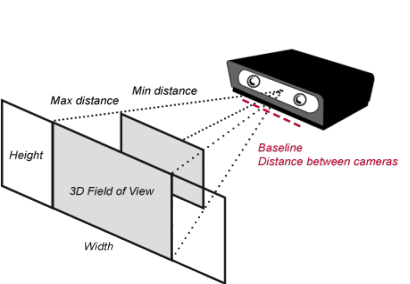 Do you have a 3D Stereo Vision Lens Calculator? To support our Scorpion 3D Stinger Camera we have created this new 3D lens calculator. Do you have a 2D Lens Calculator? We have a nice 2D Lens Calculator – it is located at Scorpion Support Web.